Victims of abuse are not always covered in bruises. Many are never even touched at all. However, the offense is just as destructive. Emotional abuse damages the victim psychologically. They become confused, and they lose their sense of self. This can go on for years, since abuse is easier to deny and justify when there is no physical component. REDISCOVERING THEIR IDENTITY, MAKING SENSE OF THEIR TRAUMA, AND REGAINING CONTROL OF THEIR LIFE CAN TAKE YEARS. THE FIRST STEP IN THIS JOURNEY IS RECOGNIZING THAT THERE IS A PROBLEM. Gaslighting is a psychological tactic in which one partner causes the other to question their own perception of reality. They dismiss the victim’s emotions as over-sensitivity and paranoia. They challenge their memories of past events. They deny, avoid, and minimize their problems. They do this all with an unflinching air of confidence and compassion. Soon, the victim begins to doubt their very sanity. Once the gaslighter has dismantled their partner’s perception of reality, they are free to construct their own in its place. This is a tricky one. When your boyfriend shows up at your work with flowers, it feels romantic. Then he starts dropping by unannounced for other reasons. Soon, he is popping into your life unexpectedly multiple times each week. You start to feel nervous, irritated, and maybe a little bit violated. Why does he feel the need to check in on you all the time? You bring it up with him, and he acts hurt. He guilt trips you. He may even accuse you of cheating on him. A partner who does not respect your boundaries does not respect you as an individual. They are trying to push you into co-dependence. Don’t let this happen. Protect your boundaries. Protect yourself. Those grades are great, for someone who isn’t really an academic. You had to stay late at work again? Haha, you know you barely make any money there, right? Congratulations on your weight loss. Keep it up and you’ll be as pretty as your sister! These insults may be disguised as humor, constructive criticism, or even compliments. However, they are designed to break you down. An abusive partner may try to justify these backhanded compliments. They may make you feel as though being upset about them is your own fault. You’re too sensitive. You can’t take a joke. A partner who makes you feel bad about yourself is abusive – end of story. Find one who builds you up instead. We are at our most vulnerable when we are alone. An abuser knows this. They will try to separate their victim from their support network. When you disconnect from friends and family, you become more dependent on your partner. This allows them to warp your perceptions, attack your self-esteem, and mold you into the doormat they are looking for. Don’t let this happen. Cling tight to the people who care for you. Listen to their concerns about your partner. Believe them when they tell you they love you. They want to see you happy and whole. “The scars from mental cruelty can be as deep and long-lasting as wounds from punches or slaps but are often not as obvious. In fact, even among women who have experienced violence from a partner, half or more report that the man’s emotional abuse is what is causing them the greatest harm,” explained Lundy Bancroft. 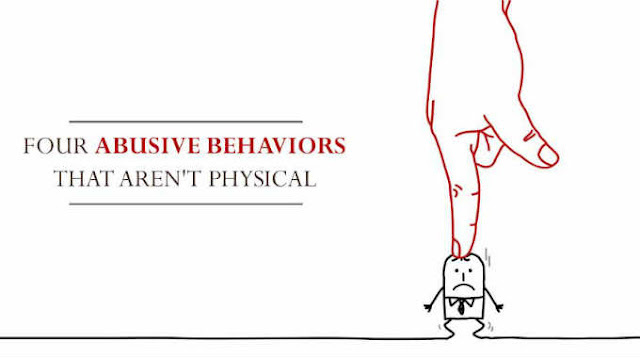 Do not minimize or tolerate abusive behavior for its lack of physicality. If you are suffering in an abusive relationship, or if you know someone who is, seek help today. This post was republished from unisoultheory.com. You can find the original post here.